Colonial Oaks Senior Living at Katy has been excellent, and they've done a great job taking care of my husband. The staff is wonderful and do a good job. The service is good and I'm really pleased with them. I thought that the people in Colonial Oaks at Katy are very friendly and helpful, and they seem very caring. They wanted to get my dad involved right away, and the staff is very gracious to the residents. While we were moving him in they served us lunch. I like the wide open spaces as you enter. It has two courtyards, and it's bright, and very nice. They have activities for the residents, he played bingo yesterday, they have bible studies every week, and they take them on trips to the store or other places they need to go. The bus has a wheelchair lift, and they came and picked him up from his other community and transferred him to Colonial Oaks. The staff members were all very friendly, helpful, and encouraging. They seem very caring and they interact well with the residents. They served us lunch and my father liked it; he also likes their supper. The place looks clean and bright, I didn't detect and odors when I was there. Colonial Oaks Assisted Living was a good and clean environment. They had a library and an exercise room. The bedrooms were pretty straight forward, just a bed and bath. My mom has been at Colonial Oaks for six weeks now. The staff is very helpful in working things out with me to make the transfer between the nursing home and assisted living as smooth as possible. The problems that we’ve had were dealt with efficiency. Great concern by Colonial Oaks. They were always willing to go over records with us -- to help with us about what our needs were and how they could be remedied. I feel like my mother is thriving. Colonial Oaks is very clean and neat. The atmosphere was wonderful and nice. The staff gave us attention right away and were informative. We just sat in the office of the director and talked to her. She was very nice and informative. I know people who have been in Colonial Oaks and have been pleased with it. Colonial Oaks' facility and dining room were nice. They offered lots of services to the residents. The staff was very nice, friendly, and helpful. The neighborhood was nice and near my home. They gave us a pie when we left. My mother was one of the first residents at Colonial Oaks, and she was there for approximately eight years. I have to say I would probably give A+. They had a lot of change in management, and turnover, though. The staff I would have to say about a B+, as what I have said they had a lot of turnover. You couldn’t have someone you could relate to, but she was taken care of well. I just think sometimes some of the management, either they are not as involved as they should be, or they don’t realize some of the decisions that effect the residents. The place is very clean. She had her own little apartment, and they were very good about it. The dining areas, the lobby, and everything was very meticulous. My mom is at Colonial Oaks, here in Katy. The people are very nice, very friendly, and very good at communicating with me. They keep it nice and clean, the meals are good, there's a very nice and friendly staff, they have very nice people, and they are very informative. I was pleased when I went on a tour before I brought her over. I got such a good feeling about the place. I really have had a good experience so far, and she hasn't been there that long. There was an instance not too long ago when her blood pressure was a little high, and her chest was hurting; they called me right away and called the ambulance. They took care of things right away. I have been really pleased. They have activities like 24/7. There is always something going on. They have a movie theater, a library, a little beauty shop, and an activity room, so there is always some kind of activity going on. Pretty much like seven days a week, they offer something. They can participate or not participate, they have that choice, so it is available for those who like to go do things. They will take them to their doctors' appointments or to do some errands, and they will take them to a restaurant once a week if they wanted to do that. They offer different sized rooms. We are praying that she will only be there a short time and can get strong enough to go home eventually, so we got her just a really small room, but they do have different sizes. We got her just a little studio. They have like a tiny kitchenette, a private bathroom, a room for a single bed, a little table, a chair, a TV, and that is about all there is room for, so it is pretty small, but for her, that is basically all she really needs because they have a dining room to go to for their meals and stuff. They are expensive but very reasonable, considering what these places run for. We placed mom in Colonial Oaks because we thought it was a nice place. It's very clean and I think they do a good job of checking on mother. They have lots of games, movies, music, and happy hour. She doesn't complain about the food, just the similar menus from week to week. She has a studio room, but it was okay. Sometimes they say they'll do something and it doesn't get done so we end up doing it ourselves. I think the communication between departments may not be as good as it should be. Colonial Oaks was near my church. I was impressed with this place. I think it was newer and nicer than the other facility we saw. I could tell when I went to that place that it was more expensive than the other facility because of how it looked from the outside with landscaping to how it looked on the inside with the décor and the color scheme. It was very nice. I knew straight-out that I was going to have to pay more money if my mom went there. They did have a lot more activities there too. Also the staff was a little bit more professional. To me, they were like mature older folks. We at Colonial Oaks Assisted Living and Memory Care in Katy understand the stress family experiences when they are making difficult decisions for a loved one who can no longer live at home, needs help with daily living, or is dealing with memory loss. We also understand that moving a loved one into an assisted living facility poses difficulties as well. With many years of experience, our Katy staff knows what is required in helping our residents feel secure and comfortable. We make sure they feel right at home, and we treat every resident as if they were our own family member. We offer a wide variety of activities to engage every resident - activities ranging from games to a variety of classes to outings and parties. For our memory care residents, we offer activities that stimulate the mind and memory. Our facility has a beautiful outdoor courtyard, a movie theater, a beauty shop and a library. We have great relationships with our residents and their families, and they are our primary referral source. To find out more about the Colonial Oaks difference, schedule a tour today at our Katy location. The Rhythm of the Day® program was specifically designed to help each person experiencing memory loss have comfortable and enjoyable moments and days by focusing on a holistic approach to care. This program consists of validating feelings, redirecting to a pleasant memory, ensuring proper nutrition and hydration, music throughout the day which brings back fond memories and creates a feeling of well-being, and activities that are specific to their desires and abilities. Thank you for your interest at Colonial Oaks at Katy. Please give us a call to schedule a free tour. 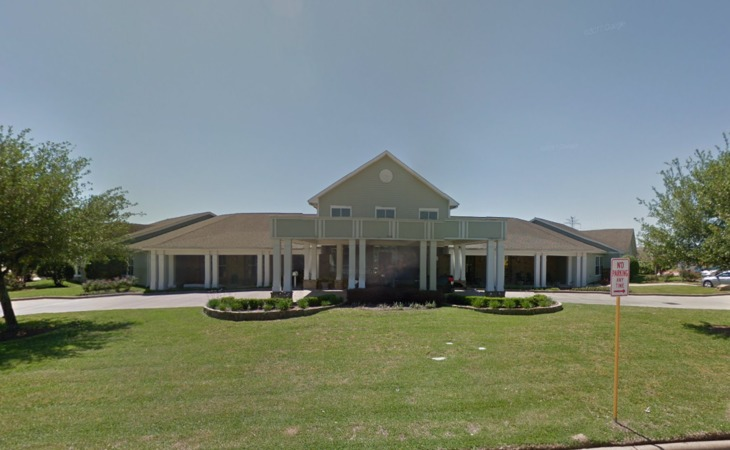 What should caregivers and potential residents know about Colonial Oaks Senior Living at Katy?